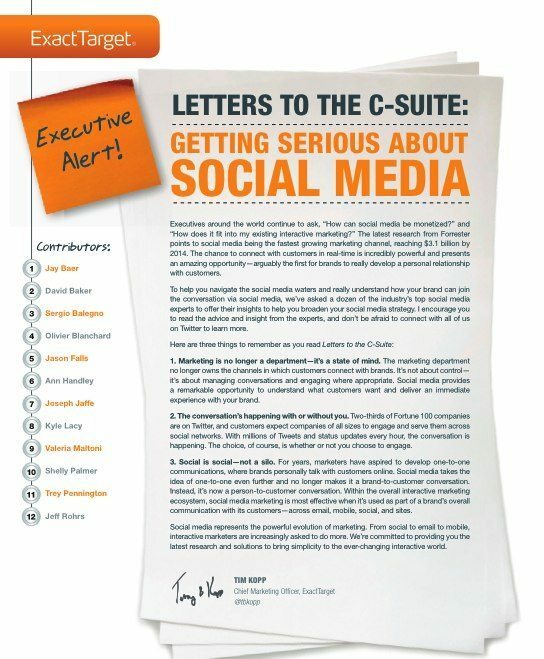 My clients at ExactTarget yesterday published a terrific, free executive briefing called Letter to the C-Suite: Getting Serious About Social Media. 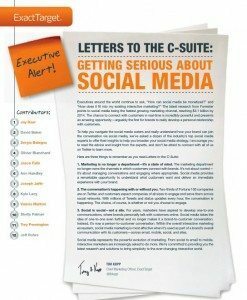 It includes a dozen letters written to C-level executives (in general) about what they need to do to take social media to the next level. Reading them through, I really wish we could have done a series of Webinars, because the content is simply outstanding. This is not some sort of ExactTarget sales pitch (although you do have to fill out a short form to download it, which I abhor). In reality though, there’s exactly two paragraphs about ExactTarget (and CoTweet) in the entire document – which is a very digestible 14 pages – and they won’t bug you after you download it. I do hope you’ll download it and come back and tell us what you think in the comments. I realize everyone is telling you social media is a unicorn, but maybe it’s just a horse? Sure, social media differs from the marketing we’re used to in that it puts the company and our customers on the same – rather than opposing – teams. But beyond that, isn’t social media more similar than different, compared to what’s come before it? I’m not talking necessarily about acquiring new customers, but rather using social media to keep the customers we’ve already earned. Maybe social media isn’t the new television, but rather the new telephone and CRM? Why would a consumer “friend” us or “fan” us or “follow” us in social media, unless they were either already a customer, or at the very least had us in their purchase consideration funnel? The average Facebook member becomes a fan of just two companies per month, yet is exposed to thousands of brands during that same period. People don’t experimentally engage with brands in social media, they engage with the brands they already support. Thus, we need to understand precisely how the company will “be” social, not just “do” social media, and then consistently manifest that relationship between us and our customers across the entire spectrum of communication tools: our Web site, our blogs, our Facebook page, our Twitter account, our email program – and even our customer service organization. Our strategies and expectations for social media are in reality a complement to what we’re doing in email and lifecycle marketing. Isn’t our Facebook page just a post-modern email newsletter? Keeping us top-of-mind with our best customers, engaging with them, giving them offers, and trying to turn consumers into advocates? If we integrate our CRM and social media, we can use our social interactions with customers to learn more about their needs and desires, and improve the relevancy of our email communications and offers. Couldn’t we use our social media outposts as targeted landing pages for our email and direct mail communications? Why aren’t we asking our blog visitors and Facebook fans to subscribe to our email newsletter? Further, we need to add the same level of testing and measurement rigor to social media that we do to email and CRM. There’s a best time to send Tweets. There’s a best time to post to Facebook. There’s an optimal structure for blog post headlines. There’s a reason that some videos show up on the first page of Google, and others do not. 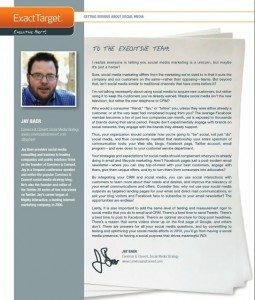 All of these answers are knowable, and if we commit to testing and optimizing our social media efforts in 2010, we’ll go from having a social media presence, to having a social purpose that drives meaningful ROI. Check out the book if you get a chance. Thanks.